Most of us are familiar with the saying “upstream without a paddle”. This is an unfortunate event, where one finds themselves without the proper resources. I have witnessed this exact phenomenon on one of my canoe trips. A pair of canoers had broken a paddle. While they managed to move, they were extremely slow, uncoordinated, and constantly yelled at each other. It was chaos. As I rowed my boat gently down the stream, I wished them luck. At that moment, they realized their fun adventure turned into a grinding undertaking. Surprisingly, this type of situation happens a lot more than you think. As businesses adopt artificial intelligence (AI), I see similarities between their journey and canoeing with one paddle. Both have great aspirations when they undertake their journeys. They excitedly explore new territory, and sometimes forget the dangers that lurk below the water. 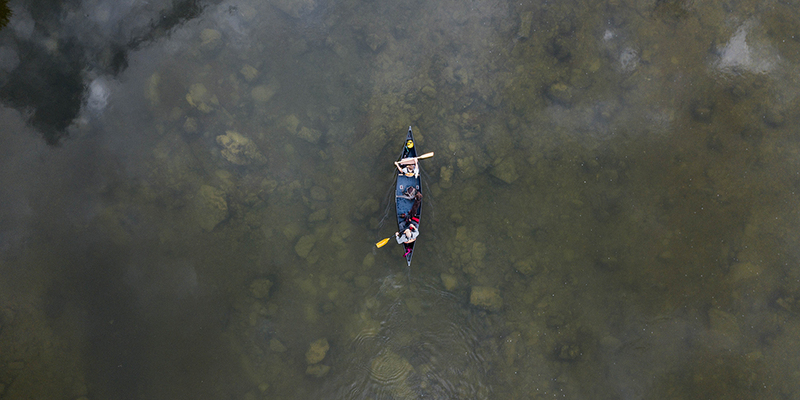 Without the right plan, infrastructure, and partner, organizations risk finding themselves upstream without a paddle. First, not planning the correct route can lead to getting lost and wasting time. Similarly, with AI projects, proper planning and coordination allow for greater ROI. Unfortunately, many business units deploy disparate AI initiatives on separate platforms. Without the proper coordination between IT and the business, a shadow IT emerges. This shadow wastes time and money on unproductive projects outside IT’s control. Thus, leaving business units uncoordinated and rowing one-sided. The canoe endlessly spins in circles. Secondly, having the right equipment on a canoe trip is essential. Correspondingly, companies deploying AI initiatives must invest in the right IT equipment. Many organizations run the risk of not having the proper infrastructure and tools in place to help them maximize AI benefits. Antiquated infrastructure makes it difficult for IT organizations to support the business. 71% of organizations lack server automation, and 61% lack servers with GPUs/FPGAs/purpose-built processors¹. Since AI applications come in different shapes and sizes, different computational complexities are required. Computational demand is even more complex with machine learning and deep learning. Finally, having the right partner along for a canoe trip makes all the difference. Having someone reliable and trustworthy allows you to reach your destination efficiently. Similarly, having the right partner on your AI journey is imperative. Fortunately, Dell EMC understands the AI challenges that organizations face. It has deep and diverse AI experiences. Dell EMC offers distinct, effective solutions for a diverse set of AI workloads. Deep investments are being made today in AI. 51% of companies expecting 2-5x the ROI from automation, this number will continue to increase. ¹ CIOs are uniquely positioned to drive business value through transformed IT. All IT actions and decisions have downstream effects. When IT teams lead AI initiatives, the company deploys twice as many AI building blocks, compared with companies where the lines of business lead. ¹ More building blocks result in higher revenue growth. It also results in better customer experiences, innovation, and operational effectiveness. Make sure when it’s your AI journey, you don’t end upstream without a paddle. When you have the proper route, equipment, and partners, you will navigate efficiently to your destination. Dell EMC is that partner with the necessary tools to help you reach your destination. Learn how to further prepare yourself and your organization for your AI journey. Dive into this study conducted by Forrester Consulting and commissioned by Dell EMC: CIOs Need To Take The Lead On AI For Transformational Outcomes Across The Company. To stay up to date on our latest resources for your AI journey, follow @DellEMCServers.